Once again a refugee crisis is at the top of the policy debate in Europe. At least three features distinguish the present refugee crisis from the one in the early 1990s. First, the primary causes for the current refugee movements are far more complex and beyond the scope of European influence. While the Balkan wars were considered mainly a Western responsibility, and Western resolve finally helped to restore stability, the current crisis involves a multitude of actors and geo-political interests, with the powers of Western nations to affect the course of events clearly limited. Second, the refugee movements of the early 1990s happened in an optimistic Europe that had just emerged from decades of Cold War and had embraced new economic opportunities and European integration and enlargement. In contrast, the current crisis hits an enlarged Europe, still entangled in the aftershocks of a deep recession and riddled by populist and separatist national movements. And third, the refugees who head towards Europe are culturally more distinct, and far larger in numbers than those in the early 1990s. As a result, at least three political challenges characterise the current crisis. First, and most importantly, European nations are by now marginal players in addressing the primary causes of the conflicts. There is no clear indication as to when the flow of refugees towards Europe will abate, and no clear timeframe for when those who have fled conflict can be resettled, if at all. Second, the dire economic situations in which many European countries find themselves, coupled with the different views across countries about humanitarian responsibilities, impede political progress. And finally, the lack of a clear legal framework, the differences in implementation and interpretation of the underlying Geneva Convention for Refugees across European countries, and the challenges the current crisis poses for the Schengen agreement have led to a situation where political progress seems very difficult (Hatton 2016). As of April 2015, 145 states have signed the 1951 Convention and 142 have signed both the Convention and the 1967 Protocol that endowed the GCR with universal coverage. The Convention’s text is generic, and open to interpretation. This has led to considerable heterogeneity across European countries in the way the GCR is implemented. EU countries differ widely with respect to the processing times of asylum applications, the overall recognition rate, and whether full or only weaker, subsidiary protection is granted. Moreover, the definitions of different European member states as to what safe origin and third countries diverge substantially. This diversity in interpretation and implementation of the GCR is one important reason for the current lack of political progress that we are witnessing (see Dustmann et al. 2016 for extensive evidence). The current inflows of refugees to Europe are unprecedented, and coincide with an all-time high of refugee movements (see Figure 1). In 2015, the world refugee population reached an unprecedented level of almost 16 million. The 2014-2015 surge is mostly explained by the Syrian civil war: in 2015, Asian citizens accounted for more than 9.5 million refugees and African refugees for over 5 million, with the remaining million equally split between European and South American refugees. 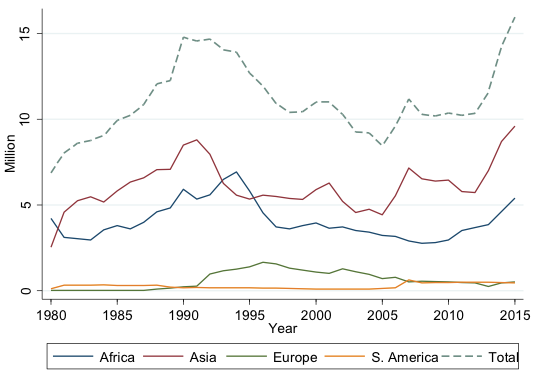 Note: The figure reports the evolution of the stock of refugees (in millions) by continent of origin, and overall, between 1980 and 2015. Source: Authors’ calculations based on UNHCR data. However, refugees represent only a fraction of the population displaced by war and conflicts. In 2015, the United Nations High Commissioner for Refugees (UNHCR) estimated that there were 59 million individuals displaced worldwide. Less than a third of them had left their origin country to become refugees abroad. It is worth stressing that most of these international movements involve neighbouring countries located on the same continent. Europe as a whole was, in 2015, hosting ‘just’ 15% of the world’s refugees. A closer look at the case of the Syrian population allows a better understanding of the relative size of these flows. As Figure 2 shows, out of a total population of almost 22 million people (in 2011), the civil war displaced almost 12 million, or 54%. Slightly more than half of them (6.6 million) are still in Syria, being internally displaced. Just 1.5% (180,000) have been offered resettlement or resettled to a safe host country. The remaining 43% (5.1 million) have autonomously reached a third country. The vast majority of this latter group (4.6 million, or 39%) are hosted under a refugee-like status in a neighbouring country: 2.5 million in Turkey, 1 million in Lebanon, 630,000 in Jordan, 240,000 in Iraq, and 120,000 in Egypt. About half a million Syrians – 4% of those displaced by the conflict – have reached an EU country and were granted asylum or are waiting for their asylum claim to processed. Of these, 40% are hosted in Germany (200,000), followed by Sweden (100,000), Austria (30,000) the Netherlands (30,000) and Hungary (20,000). 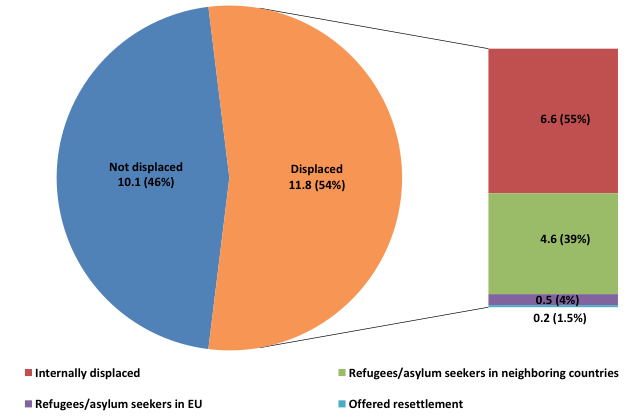 Note: The figure reports the total Syrian population, the number of internally displaced Syrians, the number of Syrian citizens offered Resettlement to a safe host country (the figure includes both confirmed pledges and individuals actually resettled) and those hosted in neighbouring countries and in the EU (including both asylum seekers and individuals with recognized refugee status). Source: Own calculations based on UNHCR Population Statistics data. Economic migrants are, at least conceptually, fundamentally different from refugee migrants in that the former not only choose whether or not to migrate but also decide, based on the constraints set by receiving countries, which country to migrate to, given the economic benefits of this decision. Refugee migrants, in contrast, are forced to leave their origin countries, often due to unforeseen and sudden events that put their lives at risk. Similarly, receiving countries typically choose economic migrants based on economic considerations, while in the case of refugee migration, they are fulfilling their obligations as GCR signatories, and the decision to grant asylum seekers official refugee status is primarily based on humanitarian considerations. As such, receiving countries may have little influence on the type of migrants that are displaced. An important decision host countries face is whether to reject the asylum claim, to grant full Geneva Convention refugee status (which often leads to permanent settlement in the host country), or to offer subsidiary forms of humanitarian protection where refugees are forced to return once the conflict or situation that has triggered refugee migration has been eliminated. Economic models (e.g. Ben Porath 1967, Adda et al. 2016) suggest that refugees have fewer incentives to invest in human capital specific to the host country if initially offered temporary protection rather than a permanent or long-term perspective in the host country. Therefore, if the primary cause for the refugee migration is unlikely to end in the near future, or if there is significant uncertainty about when it will cease (as it is the case with the current crisis), countries may want to opt for offering refugees a permanent perspective from the outset, as this may lead to improved labour market outcomes. Fast processing times, immediate access to the labour market, and active integration programmes all foster the integration process – in particular if focused on the first months and year in the host country, crucial for the refugee’s future career path – but are often not well used. How well current refugees will integrate into the labour market is difficult to forecast, yet we can look at past experiences of refugees using the 2008 wave of the European Labour Force Survey (EULFS). Conditional on individual characteristics such as age, gender and education, refugees are 18.3 percentage points less likely to be employed than natives, while the gap is 4.3 and 8.2 for EU15 and non-EU15 economic immigrants, respectively. 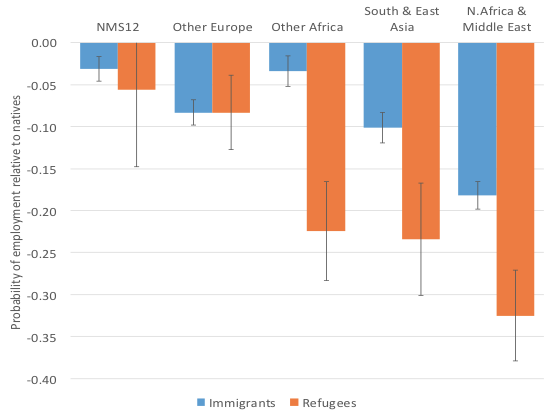 Figure 3 shows how the (conditional) immigrant-native and refugee-native employment gaps differ by area of origin: refugees from North Africa, the Middle East, or other African and Asian countries are considerably less likely to be employed than economic immigrants from the same areas of origin. Employment gaps are largest for the group of refugees from North Africa and the Middle East, at 32.5 percentage points, precisely the areas where a big share of asylum seekers related to the current crisis come from. Note: The figure displays the differences in employment probabilities between economic immigrants and natives and between refugees and natives by area of origin obtained using linear probability models estimated separately for each origin area. The regressions control for gender, age (dummy variables for5-year age groups), education (dummy variables for lower secondary and tertiary education), and host country fixed effects. We also report 90 percent confidence intervals based on robust standard errors. The sample includes all individuals aged between 25 and 64 not in full-time education or military service but excludes economic immigrants from EU15 countries. NMS12 includes all countries that entered the EU in 2004 and 2007: Malta, Cyprus, Estonia, Latvia, Lithuania, Poland, the Czech Republic, Slovakia, Slovenia, Hungary, Bulgaria, and Romania. Source: Authors’ calculations based on EULFS 2008. The current refugee crisis not only poses an enormous challenge to European countries but to the fundaments and achievements of the EU as a whole. We draw the following conclusions. There is a drastic need for a new regulatory framework agreeable to all member states that addresses the current and future challenges of refugee migration and replaces dated coordination attempts like the Dublin Convention with a more workable alternative. Such a framework should be based on two pillars: a coordinated policy that secures Europe’s outer borders and deals with asylum claims before refugees have (illegally) crossed into mainland Europe, and an allocation mechanism that more equitably distributes the burden of refugee migrations across countries yet is flexible enough to account for national particularities and political circumstances. Failure to establish such a system may in future lead to political fallout with far reaching consequences. It is the political cost rather than the economic cost that is the main concern. The current crisis is a wake-up call to develop the necessary institutions and implement needed coordination to be prepared for larger future challenges. The population of Africa, Europe’s southern neighbour, is predicted to increase to 2.8 billion over the next 45 years, from 1.11 billion in 2013 (Canning et al. 2015). This, in combination with sluggish economic development, climate change, unstable political leadership, and possibly continued conflict, will likely lead to increased migration pressures on Europe. The recent and ongoing conflicts in the Middle East are a main reason for the humanitarian disaster and the ensuing refugee flows we have witnessed over the past years. Responsibility for the current situation lies also with European countries. European foreign policy should learn from past experiences, and be aimed at avoiding conflict and instability. Adda J, C Dustmann and S Gorlach (2016), “The Dynamics of Return Migration, Human Capital Accumulation, and Wage Assimilation”, mimeo, UCL. Ben-Porath, Y (1967), “The Production of Human Capital and the Life Cycle of Earnings”, Journal of Political Economy 75(4): 352-365. Canning, D, S Raja and A S Yazbeck (eds) (2015), Africa's Demographic Transition: Dividend Or Disaster?, Washington, DC: World Bank. Dustman, C, F Fasani, T Frattini, L Minale and U Schӧnberg (2016), "On the Economics and Politics of Refugee Migration," CReAM Discussion Paper Series 1616, Centre for Research and Analysis of Migration, University College London. Hatton, T (2016), “The migration crisis and refugee policy in Europe”, VoxEU.org, 23 May. Assistant Professor, Department of Economics, Universidad Carlos III de Madrid; CReAM Research Fellow; IZA Research Affiliate.